Founded in 1969 and nationally recognized for excellence, Kensington School is a private nursery, preschool and kindergarten serving children and families in the suburbs of Chicago. Kensington School had to create a modern and informative website in line with 2017 web standards. The site had to have information regarding all their schools and curriculums in addition to a blog and careers portal. The site needed to reflect the essence of being a student at Kensington. 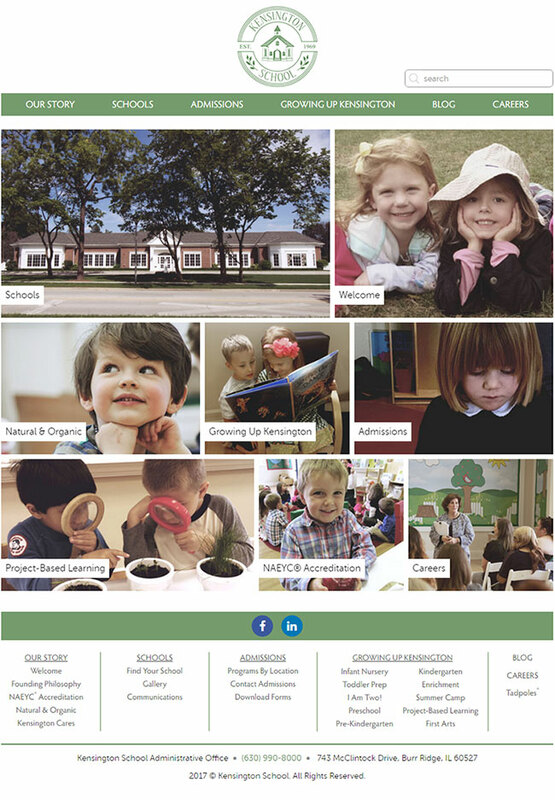 By giving the site a more English grammar school look and feel, it needed to give users the feeling that they’re visiting a high-end instiution of learning for young children. Through the use of both traditional design techniques and modern functionality, Plego was able to provide Kensington with the right blend of themes that led to the site being a success. 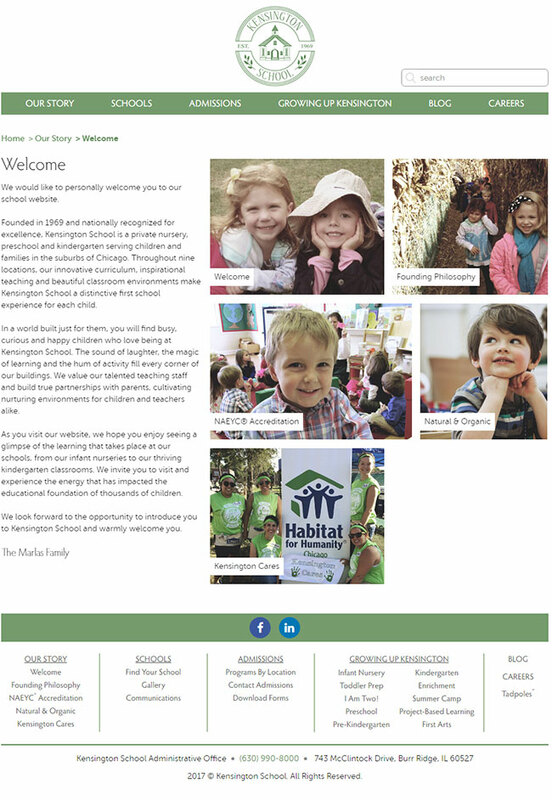 Home Page – The landing page for the organization, this gave an intro to all the different sections on the site. The boxes that composed the page were completely dynamic and transformable within the CMS. The site was built with a condensed tiled architecture, reminiscent of collages often seen on teachers walls inside of classrooms. The site wanted to give a classroom type of vibe so visitors would feel like they are in one of the schools. The experience was optimized tin all forms including PC’s, Tablets and Smartphones. Our Story – This was a collection of pages that told the history, philosophy and other pertinent information about the schools. Find your school – This was an interactive section powered by Google Maps that allowed users to find and get directions to Kensington’s Schools. Growing up Kensington – This section showcased the curriculum for the schools based on age level. From Infants to Kindegarten, users could easily browse through the tiles and get the information they needed for their children.